Another name on the catwalk at the Asian Fashion Fusion event which took place the Jumeirah Carton Tower Hotel in London at the end of last year. O'nitaa are a london-based retailer who sell a range of different asian designers and they sent a diverse collection down the catwalk. 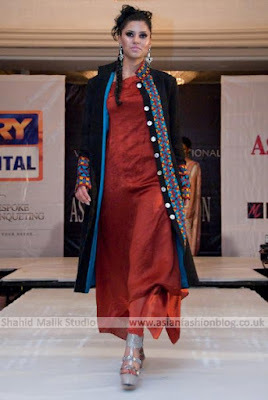 Photos are courtesy of Shahid Malik Studio. I like the 3 pajama suits above, especially the off-the-shoulder pink outfit above. 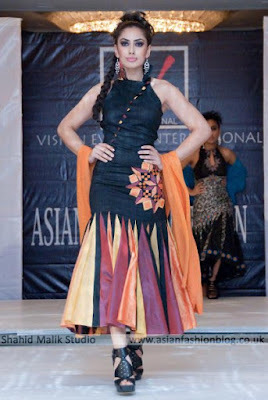 Not such a fan of the dresses below though, not elegant enough for my liking? I like that these next two dresses come with matching jackets. They're perfect for the cold and often temperamental weather in the UK, and we all know how difficult it can be to find the perfect coat to go with your asian outfits.